The wildlife in Milford Sound includes some of the most intriguing and unique animals and plants in the world. Native rainforest fringes the cliffs, containing precious birdlife, while down below a marine reserve protects the fish and visiting mammals like seals and dolphins. Here’s a guide to Milford Sound wildlife. The heavy rainfall and surrounding rainforest create a unique effect in Milford Sound – the top layer of water is fresh water, while the rest is salt water from the Tasman Sea. As rainwater runs though the forest into the fiord it becomes stained with tannins, making the surface layer a darker colour. Lush rain forests cling precariously to the cliffs and gardens of coral grow beneath the water’s surface, creating a magical playground for the wildlife of Milford Sound. There’s barely a corner of Fiordland National Park and the Milford Sound region that isn’t overflowing with wildlife. From insects and birdlife in the abundant native forest to the show-stopping antics of fur seals and dolphins, a visit to Milford Sound will satisfy the most ardent nature lover. Many of the plant and animal species in Milford Sound can only be found in the Fiordland region due to its remote location and the damp wet weather, making these encounters even more special. With cruises and walking tracks taking you right into their home environment, you can have an up close and personal experience with the inhabitants of Milford Sound. But the focus is on conservation of these beautiful animals and plants – Milford Sound cruise operators ensure you can get as close as possible to the local wildlife without disturbing it. Don’t miss out on the flourishing plant and animal life under the water, either – visit to the floating Underwater Observatory or go scuba diving for a unique view of Milford Sound. Playful dolphins dive and leap in the waters of Milford Sound. There are more than 60 bottlenose dolphins living in the area, so it’s not uncommon to see them riding the bow wave of cruise ships or visiting groups of kayakers. 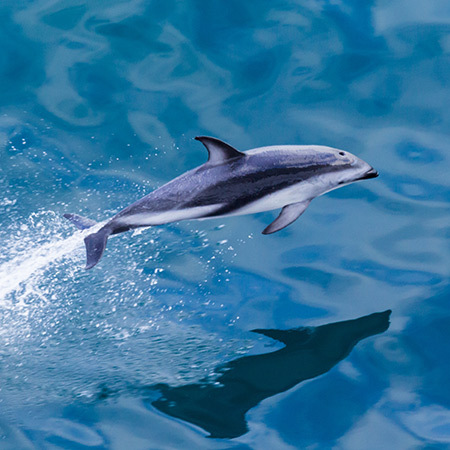 Bottlenose dolphins can grow up to 3 metres long and weigh up to 300 kilograms. Dusky dolphins are also occasional visitors to Milford Sound. These are smaller than bottlenose dolphins, growing up to 1.75 metres long, with dark grey backs, white bellies and a two-toned dorsal fin. If you’re really lucky, you might even see a whale in Milford Sound, although they are infrequent visitors. 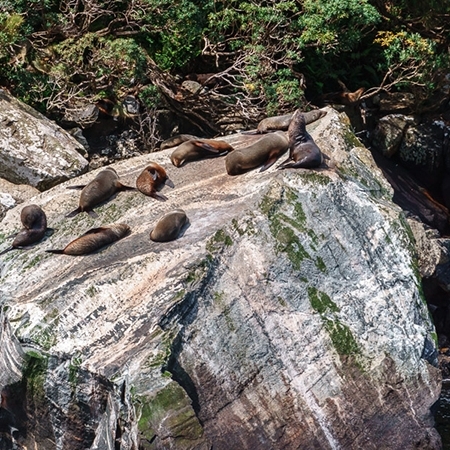 New Zealand fur seals inhabit Milford Sound year round and can often be seen basking in the sun at Seal Point, where the rocks are not as steep and can be easily climbed. These seals were once close to extinction thanks to hunting in the 19th century, but are now protected and are growing in number. New Zealand fur seals can grow up to two metres in length and weigh up to 200kg. There’s a good chance you’ll see a penguin during your Milford Sound cruise as two species are regularly found in the fiord. The Little Blue penguin is a relatively common penguin, while the Fiordland Crested Penguin is an endangered species, one of the rarest penguins in the world, and is only found in Fiordland and Stewart Island. The Fiordland Crested Penguin is unmistakable, with its bright orange beak and blonde feathers on either side of its eyes. 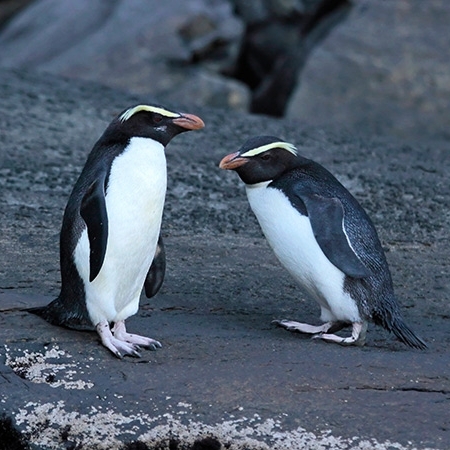 These penguins visit the same beach each year to mate and often mate for life. They lay their eggs in August and the chicks become independent in November or December. The very rare Blue Duck or ‘whio’ in Māori lives within the native forests of Fiordland National Park. They make their home on fast-flowing rivers, and can often be found around the Eglinton Valley and Monkey Creek on the Milford Road. Fiordland and Milford Sound are home to a wide range of native New Zealand birds, including the Takahe, Kakapo, Mohua (yellowhead) and Kea. Takahe and Kakapo are both critically endangered and you’re unlikely to see them. However, the adventurous kea, an alpine parrot, is a curious bird and likely to pay a visit. But be careful – keep bags, tents and car windows closed, because kea like to steal things! Seabirds like shags (cormorants), Sooty Shearwaters and gulls can often be seen in the skies over Milford Sound – keep an eye out for them during your cruise. Something rare and fascinating grows in the depths of Milford Sound – black coral. Known as antipathes fiordensis, this black coral is native to the Fiordland area. Black coral usually lives in the depths of the ocean, but thanks to the geology of Milford Sound you can see black coral as little as 10 metres below the surface. As heavy rainfall drains through the lush forests, it becomes stained with tannins until it is the colour of strong tea. Because fresh water is less dense than salt water, the rainwater forms a protective top layer over the salt water from the incoming Tasman Sea. The darkened fresh water blocks sunlight, with light levels at 10m deep in Milford Sound being equivalent to those at about 70m in the open sea. Due to this unique environment, the fiord supports the world’s biggest population of black coral trees. Much like Milford Sound itself, black coral has been misnamed, as only the dead branches are black and it’s not strictly a coral species. The living colonies are brightly coloured, with yellow, green, white and orange varieties on display here. As well as 60 varieties of black coral, Milford Sound is also home to rare red corals and the enormous bubblegum coral, which can grow up to seven metres high and live for centuries. There are about seven million colonies of coral in Milford Sound. The area surrounding Milford Sound is home to some fantastically diverse flora and fauna, with over 700 plants found only in Fiordland. Native beech forests as well as New Zealand rimu, miro and totara trees flourish amongst lower-lying ferns. Ancient giants are home to epiphytes (parasitic plants). You can discover Milford Sound flora and native plants on one of the many Milford Sound walking tracks in the region.